I found the stock horn rather anemic and after studying Gadget's web site, decided to install the relatively cheap but loud Stebel Compact horn. I bought two here, one for my car as well. I bought the horns here. They had about the lowest price and delivered quickly. This is the horn and package contents. 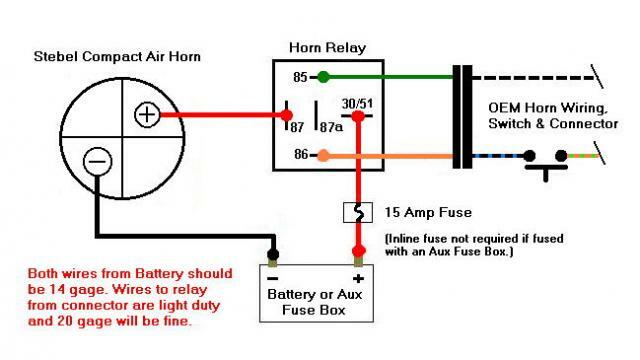 I found this useful wiring diagram on the web. The relay that came with the horn did not have the 87a terminal. I located the relay near the horn so I could use the stock horn wires to activate the relay without having to extend them. Connect the stock wires to position 85 and 86. I ran a 14 ga (recommended) from the negative horn terminal to the horn mounting bolt and ran a 14 ga wire to the accessory plug under the seat. I also used a 14 ga wire from the positive horn terminal to the 87 terminal on the relay. I used all black wires so they don't stand out too much. I put a 15 amp fuse in the accessory circuit (under right site cover) and all worked fine. I installed the horn in the stock position because I didn't want to take the unit apart. I used a piece of 1/8" x 3/4" bar and bent it to fit. I painted the bracket black and bought a slightly longer bolt at the hardware store. The relay is tied to the choke behind the horn. Only the wire to the accessory connector can be seen. Installation the way I did it does require removal of the tank. To test the horn, you will need to install the instrument panel temporarily by connecting the two plugs. I'll paint the bolt head black eventually. The horn works great and has instant response when you push the horn button. AND IT IS LOUD!! which is a good thing.